How is you summer so far? I can’t get over how quick it’s going. Living in Northern California I can’t believe the odd weather were having. Last Saturday it actually rained, which is very odd and random. I keep hearing how everyone has had such a hot summer and it feels like we haven’t had much of a summer at all. It must be a global thing? I am just hoping for a nice warm fall. I’ve been doing pretty good at not grocery shopping and just using what I have on hand, that’s how I created today’s recipe. I looked in the cupboard and I saw one lonely, over ripped banana, check the fridge and I saw wonton wrappers and thought ohhh, Nutella and Banana Wontons. I’m still damming Europe for introducing me to Nutella! This stuff is like a creamy chocolate heaven. I can’t get enough of it! I put it in my yogurt, oatmeal, ice cream and don’t tell anyone but I have even taken a couple of spoonfuls. What is with the stuff? I just love it and I am officially and addicted Nutella fan! This little snack is pretty easy to make and only takes about 11 minutes to bake it! 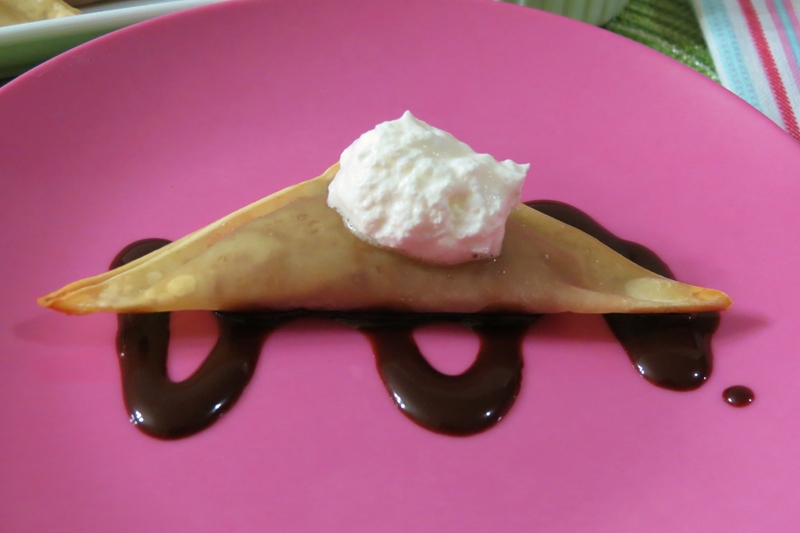 I took my lonely banana and 1 tablespoon of Nutella mixed it together, placed inside a 3 1/2″ Wonton Wrapper, folded into a triangle, squirted some butter on it topped, sprinkle with sugar and then these little babies were born. I really like using Wonton Wrappers. There so easy and you can fill them with any kind of filling you like. You can bake them or boil them. I think I really like them because there so versatile. 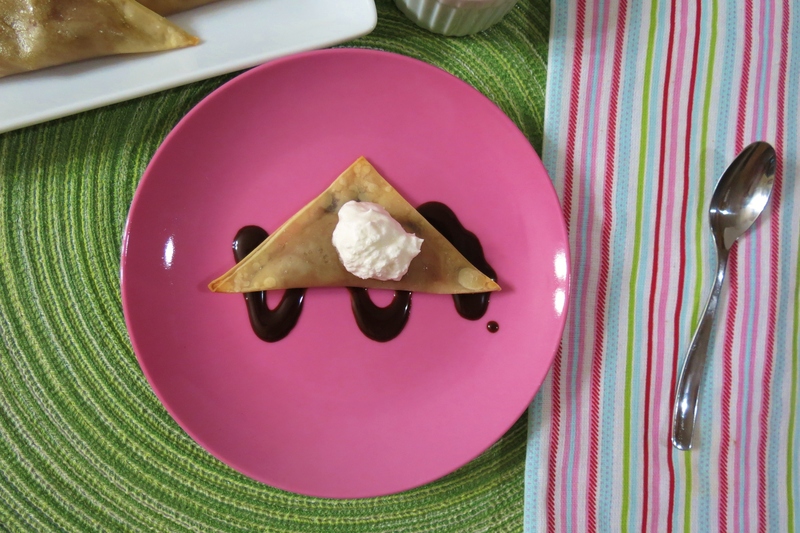 This was my first dessert I have made with them. In the past I made Buffalo Chicken Wing Wontons, Taco Wontons and Crab Wontons. Anything I have made with Wontons is a huge family hit. 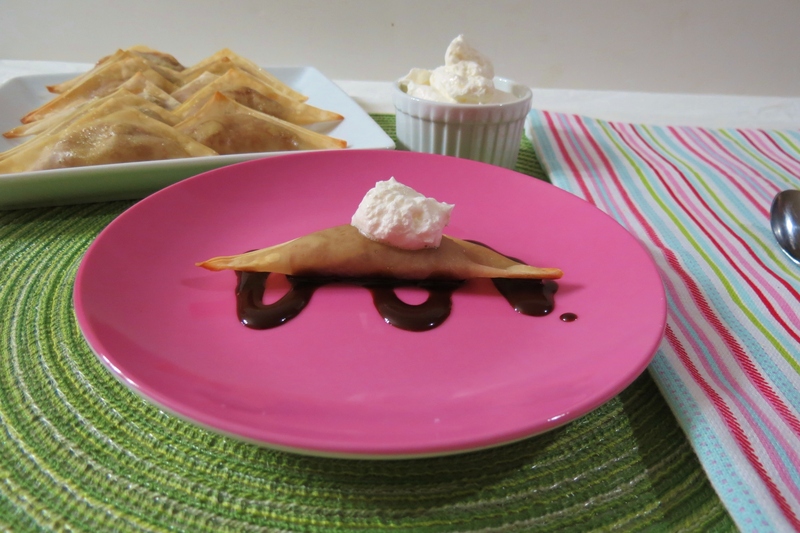 I served the Nutella Banana Wontons with a side of whip cream just for a little added sweetness. These kind of remind me of miniature pies. There crispy around the edges and soft and gooey in the middle. I will tell you if you make these, you really need to eat them when they come out of the oven. When they sit to long the middle sinks and they lose there pizzazz. Goes the same for any Wonton recipe I have made. But hey, I don’t really think that is a problem, because having treats like this, they go fast! 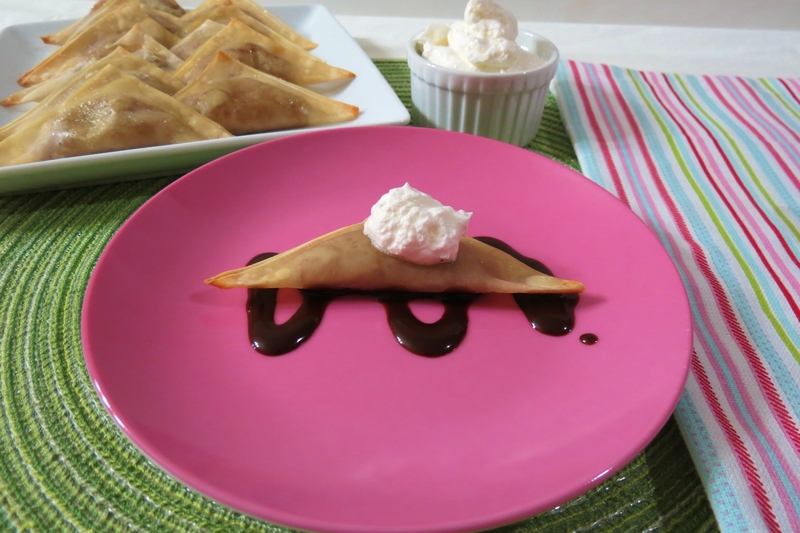 A crispy little wonton filled with banana and Nutella. In a tiny bowl, add some water. This is for sealing the edges of your wontons. In a small bowl add your banana and nutella; combined until smooth. 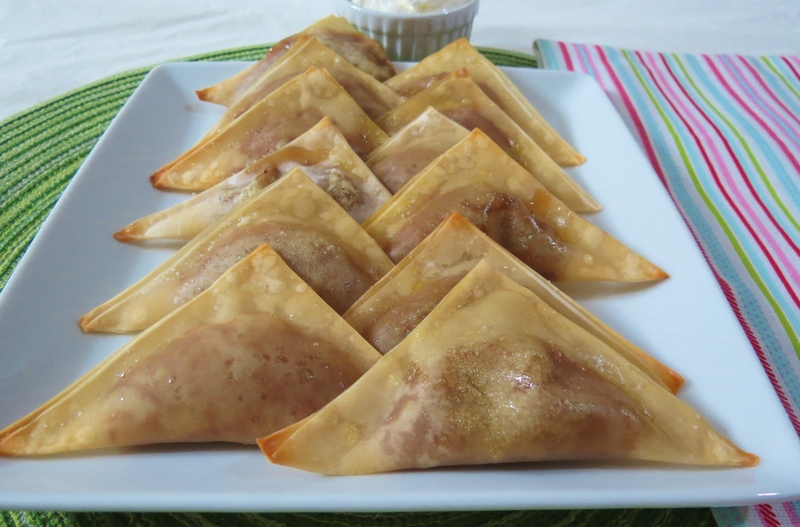 Take heaping 1 tsp of banana mixture and place in the middle of your wonton wrapper. Take your finger and dip in water and place along the edges of the wrapper (this will be the glue to seal the wrappers together). Fold wrapper over into triangle place on baking sheet. Do the same for the rest of the wrappers. Spray each wonton with about two sprays of butter and sprinkle with sugar. Bake in over for 11-15 minutes, until lightly brown. Do you ever use Wonton Wrappers? If so, what kind of goodies do you make? I know after creating this little dessert, I will most definitely be making more!!! Oh yum. I remember seeing Giada De Laurentis making something like this years ago and it was the first time I’d ever heard of Nutella (I don’t think she added banana, though, which is brilliant). It sounds amazing! I love Giada, I always miss her show though since it’s on in the day, she is a fabulous chef! Love Nutella and banana together, a fabulous combo, but then again Nutella on just about anything tastes good. I love wonton wrappers!! 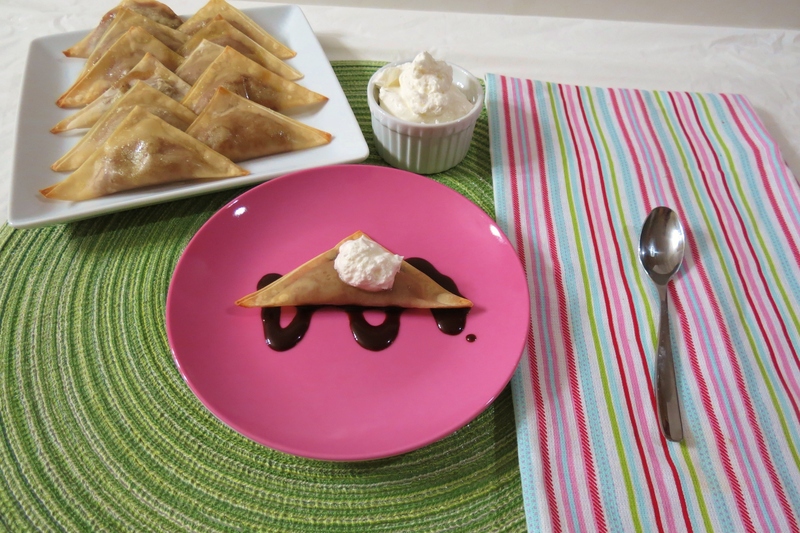 More wonton wrapper recipes please, especially now that fall is growing closer–it’ll actually be bearable to turn on the oven! Yah, it’s been pretty hot turning the oven on. I normally bake on the weekends or late at night. I’ll make more wonton recipes this fall, but for now I’m sticking to the grill or no bake recipes. What a great way to use wonton wrappers! And I’m right there with you…I should have never been introduced to nutella. It is so good! I could eat it daily (and I have done so for a period of months) Thank you for sharing this! Nutella is dangerous! I normally don’t care for hazelnut but Nutella, oh man is a whole different story!! I could so eat it daily! Just stop it with this deliciousness!!!! Thanks! I linked up. Thank you for having me! Thank you!! Darn that Nutella! I know that darn Nutella gets me every-time! I love it!! I’m a huge fan of wontons and nutella and bananas too! I’m also a big fan of things that are relatively easy but look like a they were not. Thanks for sharing on Whatcha Whipped Up. Thanks for having me! 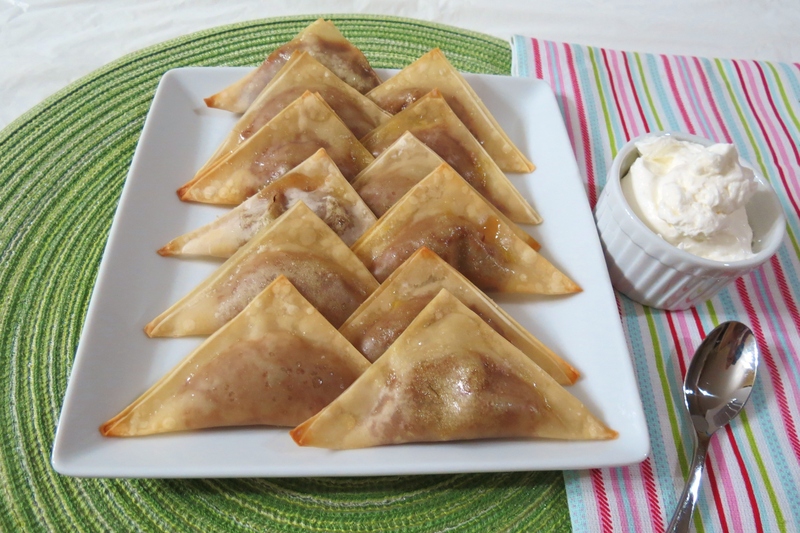 These are the most easy little snacks and I love the surprise inside!